Simple or simplistic is always a dangerously thin line to walk with a record. Too complex and sophisticated has a tendency to be non-commercial by nature but at least it’s artistically ambitious which will get you plaudits from those in the know even if it means you’re bumming cigarettes and a place to crash after selling twelve copies of your latest record. So producers and record execs, hardly the most sophisticated music people to begin with in the indie label circles of the 1940’s, mostly pushed for accessibility. Keep it simple. A melody that was easy to remember and hum along to. A relatable storyline, sung with clear diction and played by the band with no unnecessary frills. Straightforward and to the point. It’s not easy because on the other side of simple, mere inches away in fact, is simplistic and there’s oftentimes no recovering from that assessment by the public. You may think you’re going well and adhering to the basic requirements to make it modestly appealing but if you should lose your balance for even a split second and sway across that line chances are the while kit and caboodle will come crashing down upon you in a heap. All it takes is one slight misstep. A trite turn of phrase. A cliché too obvious to be overlooked. A misjudged vocal embellishment or a lack of vocal urgency. The pitfalls are so many that navigating a song on the border between the two territories can be fraught with more peril than trying for something impossibly difficult. At least then your failure won’t be mocked, it’ll actually get you some admiration for the mere attempt. Not so if you play it safe and still trip and fall by not watching where you’re stepping. I’ll Always Be In Love With You is the ideal example of just such a high wire feat. A precarious balancing act which always is just a step away from tumbling into the abyss and being scoffed at by the audience for its simplicity which makes its ultimately successful navigation to the end of the record all the more impressive. We’re just over a year into rock, and because there was an interminable stoppage of new material thanks to the recording ban, there hasn’t yet been much chance for predictability to work its way into the mix. Maybe a few instrumentals have been by the numbers but I’ll Always Be In Love With You is the first vocal record that I think deserves to be called “generic” by its intent alone. But if done right that doesn’t have to be an insult, insinuating a lack of ambition and trust in the audience. While it’s true that it doesn’t aim very high it’s equally true that should it reach its modest aims the results will be more than satisfying to the record buying public all the same. The key – then, as always – will be whether they can keep it simple without succumbing to being merely simplistic. The song they had to work with wasn’t promising in that regard if you knew its history. First done in 1929 by Fred Waring and His Pennsylvanians (rock stars of their day in terms of mass adulation, though obviously not anything close to actual rock music in style) it was one of the most popular songs of that year and was cut by a number of big names. But it was music pointedly suited for the social mores and musical standards of THAT era, an artificial – soulless – view of love as a mere social construct rather than a passionate physical and emotional craving that can’t be denied. Surely behind closed doors folks in the 1920’s and 30’s WERE enjoying the dirty deed (I presume… I wasn’t there obviously) but they were not under any circumstances allowed to ADMIT they were enjoying such acts, or even that they were partaking in them, in any public forum such as popular music. And so all of the early versions of the song, and there are many to chose from (I recommend the Belle Baker version for sheer over-the-top hilarity) are sung from the point of view of a hapless virgin who may have shared a lone dance, perhaps a peck on the cheek from a potential suitor and then had that person leave them for another. The problem with the song regardless of who did it was that perspective it offered. No matter how technically precise they sung it, no matter how much melancholia they infused it with, the sentiments behind the lyrics were always detached. You can be polite about it and say they were putting on a brave face, not letting their emotions get the best of them, but that’s utter nonsense. They were sexually and emotionally repressed by design and as a result, unless you are one who buys into the shallow romanticism of love in an alternate asexual reality that was foisted upon the world for generations in a lingering haze of Victorian era prudishness, you can’t possibly be INVESTED in the outcome of these ineffectual saps. But times had changed by the dawn of the rock era and that kind of artificial and wooden delivery wasn’t going to cut it with a generation just coming out of war… people who saw the possibilities on the horizon (jobs, social status, education, luxuries, you name it) and wanted, even expected, to partake in it all… people who came of age in a time where the town limits were no longer the farthest point you’ve traveled. This was the modern age of telephones, radio and television. Of flying across the continent in an airplane, or at least driving cross-country in cars that didn’t look merely like wagons shorn of their horses. It was a new era demanding new viewpoints and rock music certainly offered that… most of the time. But this song that rock now appropriated HADN’T progressed in that time, even as it was cut frequently in the intervening two decades by huge names such as Ella Fitzgerald, Sammy Kaye and Vic Damone, yet somehow their deliveries while singing it hadn’t changed much since the days when all the male singers were impotent and the females were all frigid. Yet all but the most tone deaf would admit I’ll Always Be In Love With You DID have a subversively catchy melody which had been highlighted by instrumental versions by some notable bands led by Count Basie, Fletcher Henderson and Benny Goodman among others, where the tempo was played around with in order to inject some life into it for a change. So it was at least conceivably possible to do so with the delivery of the lyrics as well. The question thus became how would this unknown group calling themselves The X-Rays handle it? Would they draw from those more creative instrumental versions and attempt to loosen the girdle on the old gal, or would they too take the standard vocal approach used to date and rein things in and consequently put you to sleep? Right away, especially if you were at all familiar with previous versions, you had to be elated when you heard the grinding saxophone riff that opens The X-Rays version of I’ll Always Be In Love With You, so urgent does it sound compared to the repressed emotions of all that came before it. 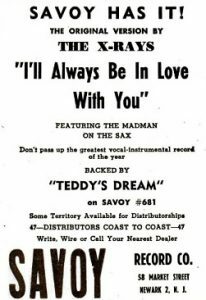 Savoy Records knew this was the case as well, as their ad for the record highlighted this aspect by “The Madman” as they called Hal Singer (interestingly, since he’d already achieved stardom with Cornbread on their label a few months earlier, why they wouldn’t want to draw even MORE attention to his presence here by using his ACTUAL NAME is beyond me). It’s the musical backdrop that plants this squarely in the rock kingdom, gritty and sensuous, emphasizing the basic backbeat of Bobby Donaldson’s drums to get your attention, but even here it’s kept simple. If you were to draw up an stock arrangement for early rock this might be it, yet Singer’s sax solo keeps it from ever veering into the simplistic. As for the vocals… well, The X-Rays were promoted as a vocal group theoretically, yet there’s only one voice heard here, Milton “Tippy” Larkin. Well, it’s typical record business intrigue, only the results are a little more effective than most smarmy tales from this realm. The origins of this reworked version of I’ll Always Be In Love With You were found in another group, The Ray-O-Vacs, whom we’ll be meeting shortly with their competing record. They’d cut this as their debut for another Newark, New Jersey label, Coleman Records that same month, but before their record was released Savoy’s chieftan Herman Lubinsky somehow got to hear the master for it and realizing its commercial potential promptly looked to cover it. Having no time to waste he went into the studio with an ad hoc “group” led by Singer and needing a vocalist they handed the chores to Milt Larkin, a well-regarded trumpeter who occasionally sang, naming the outfit The X-Rays to emphasize the group nature of it. Maybe this was done because that was more commercial at the time with The Ravens and Orioles scoring big, or perhaps to better be able to thwart The Ray-O-Vacs when theirs came out by having two “groups” going head to head (each with a single letter and the word “ray” in their names – yes, record companies DID think of such things in an ongoing effort to dupe the public), so listeners might not be able to discern one from the other as easily as they would if one were credited to a solo singer and the other a group. The gist of it is The X-Rays, despite cutting it last, and in fact being put together with the express purpose of covering it, beat The Ray-O-Vacs to the post and as such they got out of the gate with their release first and it promptly took off, their record hurtling into the Top Ten in no time. By the time Coleman Records got on the ball and rush-released The Ray-O-Vacs “original” rendition it seemed to the public at large like they were merely jumping on the bandwagon even though they were the ones actually responsible for conceiving the new modernized approach for the song in the first place! Though seemingly underhanded in stealing the thunder from another act, in this case I can’t blame Lubinksy and Savoy for their opportunistic grab, the fault clearly lays in the far more inexperienced Coleman Records for first letting the recording find its way to a competitor’s ears, then in not releasing and promoting their version faster to head Savoy off at the pass. As for The X-Rays take on the song, and Larkin’s vocals specifically, though reasonably effective they’re the weakest part of the record by far due to his tendency to mistake simplistic for simple. He’s still a HUGE improvement over most of the straitlaced versions that existed in the pop world before this, but his delivery takes little chances and thus it harkens back just a little to the neutered precedents. Luckily though his voice is just soulful enough in its natural state to render any idea of this being merely bland pop backed by a rock group as moot. It may indeed be a generic rock vocal delivery, but it works well enough to carry the melody and let the sax do all the heavy lifting. Actually Larkin’s slight misreading of the cadence of a line at the end forcing him to adjust on the fly winds up being the best moment because it’s slightly off the beaten track for where we expect it to go. A mistake or serendipity it matters not because by now we’re right in the groove with him and while this might by the first example of a label setting out to consciously make a rock record using detailed diagrams of what it needs to contain in order to hit all the right marks and connect with an audience, rather than the organic way rock records prior to this came about, it nevertheless works as well as it does because those plans were followed so closely. Unfortunately it also shows that like most anything in this world, however creative it began, rock ‘n’ roll could in fact be manufactured in a laboratory and still satisfy the audience’s cravings for the real thing. As such I’ll Always Be In Love With You was the first notable example of rock as an interchangeable product, its origins cynical and calculating, the antithesis of everything we tend to champion artistically. Yet it’s also a good record that redeems the hoary source it stemmed from and offered further proof that from this point forward rock would be breaking, and then re-setting, more of the ground rules in music. It shouldn’t be at all surprising that as a proudly uncouth outlaw style sometimes they went about it by out and out theft. Oh well, the statute of limitations on it have long since passed anyway, so we’re not gonna hold it against them. 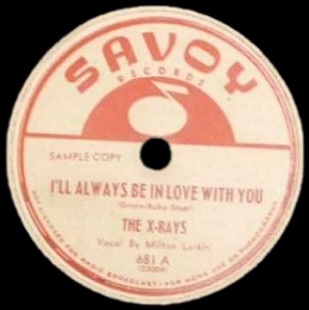 Leave a reply on "The X-Rays: “I’ll Always Be In Love With You”"